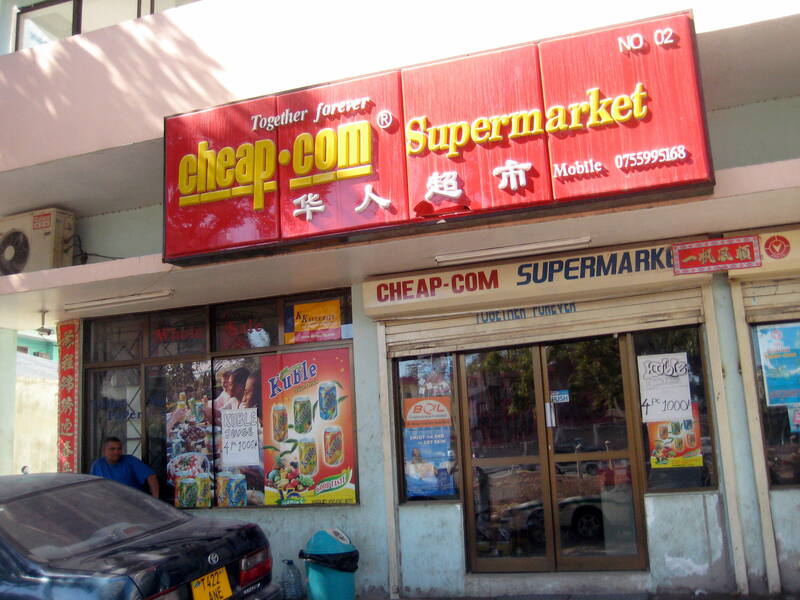 Note: I wrote this article about Chinese traders in Dar es Salaam for publication a year and a half ago, and for some reason it didn’t get picked up. I thought it was an interesting subject because China’s involvement in Africa is often discussed from the perspective of its political and global economic implications, when for most of the businesspeople involved in trading, those things don’t really matter. They don’t see themselves as protagonists (or antagonists, as many in the West like to claim) in that kind of a story — they’re just trying to make a buck. I have a hunch this dispatch is still pretty up to date, but if I’m missing some major change that’s occurred in the last year, please let me know in a comment! Enjoy. DAR ES SALAAM, Tanzania – Perched on a plastic chair in a wholesale fabric store in a working-class neighborhood here, Tony smiles. The sanguinity is a little surprising. Tony (birth name Tau Fu, originally from Shanghai, China) has just described watching an armed robbery at the moneychanger’s across the street, his futile attempt to recover lost goods from a burglary at his storage facility, and the memory of another Chinese trader who was shot and killed in another stick-up. Like many of the other Chinese traders who are arriving in Dar es Salaam and other major African cities, he is focusing on opportunities, not challenges. Mostly young and male, they travel thousands of miles from home to open markets for their cheap, mass-produced goods. They live in poorer neighborhoods than many Western expats but without ties to local communities, and stay for years at a time. It can’t be easy. And yet they continue to come – more, it seems, every day. Tony’s story sheds light on the migrant experience. The 27 year-old studied English in college and began working for the Kangxing Trading Company, a textile operation with its own factory. After two years of work, his boss sent him to open a shop in Tanzania, joining Chinese traders who had been opening businesses here since the 1990s. Drawing on a mix of adventurousness and ambition – he was promoted to manager of his own store – Tony agreed. He arrived in Tanzania as an agent of the company, conducted market research for his boss, and opened up a storefront in Kariakoo, the cheapest area in downtown Dar es Salaam. Tony estimates there are about 80 other Chinese-owned shops in the neighborhood, and there is a Chinese population big enough to give the area a feeling of an ethnic enclave in its infancy. There are now markets for Chinese food and a few restaurants scattered throughout Dar es Salaam. Chinese workers staff many of the stalls in the seething streets, selling shoes, fabrics and other manufactured goods. At first glance, the traders have a good relationship with locals. Sitting in doorways, they slap five with passersby and trade jokes. Some speak Swahili better than they speak English. In Tony’s store, a younger Chinese worker and a Tanzanian employee sat on a bale of synthetic curtains and teased each other about their cultures’ differing preferences in women. But not everything is so cozy. On the one hand, Tanzanians have welcomed the availability of cheap goods. There is also resentment, however. Some say the Chinese have undercut local traders. Their goods do not have a reputation for quality. Some people claim they have driven up rents in the once affordable neighborhood. For their part, some of the Chinese businesspeople feel unsafe. “It’s easy to rob Chinese people, because they’re not local,” Tony said. In a fish market on the waterfront, local fishmongers trash-talked another Chinese textile trader, a 28 year-old named Ni Je, after he passed their stall. “Mchina is no good,” a man said, using the Swahili term for a Chinese person. The seller gestured to a huge fish lying on a table. “He wants to buy this for 2,000,” he said, quoting a price in Tanzanian shillings that is a about $1.50. Ni, who goes by the name Andy when doing business with foreigners, had not even expressed interest in the fish. But the judgment had been passed. Ni says he doesn’t let incidents like the one at the fish market bother him. After all, he’s here to make money, and there are people who try to bother you everywhere, even back home. As for the cheapness of Chinese goods in Tanzania, Ni says it is simple economics. “Chinese can produce anything,” he said, but African customers cannot usually afford the higher quality goods. So producers lower costs – and standards – to the point where the goods will have a market in countries like Tanzania, where 96.6 percent of the population lives on less than $2 a day, according to United Nations figures. The first significant numbers of Chinese arrived in mainland Tanzania in the 1960s to build a railroad. Later, China sent doctors and invested in other big-ticket construction projects. At the diplomatic level, the countries enjoy friendly relations. In 2008, Tanzania was the only African country through which the Olympic torch passed during its round-the-world relay. China’s presence in Africa is controversial. While African leaders like Paul Kagame of Rwanda have hailed Chinese investment in Africa, Western rights groups have criticized China’s business-first relations with alleged rights abusers like Sudan and Guinea. For the smalltime businessmen in the streets of Kariakoo, though, the focus is much more immediate: a dollar earned, a rung climbed in the ladders of their careers. All asian people like to work. It’s in out blood to work. We work to make money and then to save the money or make more. The cycle recycles itself. We will work long hours to short hours as long as we get paid.